Beginning this fall, 530 first-year students will begin their honors experience in the brand new, state-of-the art Honors College Living/Learning Community (LLC). The facility is also the administrative home of the Honors College and provides classroom and conference space as well. Arts and Sciences and other honors programs at Rutgers will continue operations on various Rutgers-New Brunswick campuses, but freshman entrants from now on will share the first-year residential experience at the new LLC, a fact that provides cohesion, mentoring, and lots of mutual reinforcement for the new students. The Honors LLC is located in the heart of the College Avenue Campus, the oldest of the five New Brunswick campuses and site of the original university. The College Avenue Campus is home to the Student Union, Health Center, the school of Arts and Sciences, and many academic departments. Below are excerpts from a great piece on the new college and LLC, written by Adam Clark of NJ Advance Media. One of the key points in the piece is that Rutgers, like many other public honors colleges and programs, is trying to give high achieving students in the state a public in-state option that takes into account the special abilities the students bring to the university. As an honors student in high school, Amanda Fraticelli loved the atmosphere of being surrounded by top students, she said. Fraticelli, of Toms River, said she was motivated by the way students challenged one another to do better academically. While some of her high school friends went to Ivy League universities and Fraticelli picked Rutgers University, the incoming freshman doesn’t expect that challenging atmosphere to change too much. “I like knowing that everyone else (here) cares as much as I do,” Fraticelli said as she moved into her dorm room on Thursday. In Fraticelli’s residence hall, some students might care even more. Thursday marked the official opening of The Rutgers-New Brunswick Honors College, an $84.8 million, 170,000 square foot complex where the best and brightest of New Jersey’s state university will live alongside some school faculty and the academic dean. All 530 honors college stdents, with an average SAT score more than 600 points higher than the state average [of 1526], moved into the building that also houses the offices of their academic advisors and honors college administrators. Rutgers is one of dozens of state universities nationwide investing in honors colleges as a way to compete with elite colleges to attract the state’s brightest students. The honors programs often offer upgraded housing, smaller classes and other perks to draw in top undergraduates. In recent years, Rutgers has stepped up its efforts to recruit high-achieving students, starting a new scholarship program for applicants with top SAT scores and high school grade point averages. The efforts come as New Jersey remains one of the country’s largest exporters of college students — sending more freshmen to out-of-state colleges than most other states in the nation. Rutgers has long had honors programs for students from certain campuses or schools. But the new honors college for the first time brings together the top students of all academic majors under one roof. For some students, earning a spot in the honors college is simply a perk. They had planned to attend Rutgers anyway but like the idea of being surrounded by students with similar academic goals, they said. 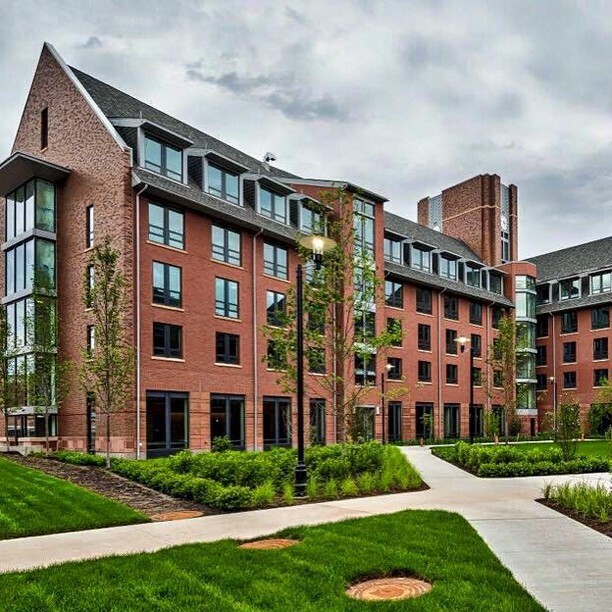 The fact that the honors college is the newest residence hall on the College Avenue campus made the decision easier students said. The double rooms come with the same amenities as other on-campus housing, plus carpeted floors and air conditioning. Some rooms at the end of the hall have a view of the Raritan River. Unlike the large, group-style bathrooms in more traditional college dormitories, the honors college has smaller bathrooms throughout each floor. On the ground floor, seminar rooms will host some of the first-year classes. An indoor-outdoor fireplace anchors a lounge and patio space. Students have to pay slightly more to live in the honors college housing, which is only for freshmen, but they are also allowed to stay in their rooms over school breaks. For parents, that fact that students will be living in a building with in-house academic advisors is a relief, they said. “It gives us a better feel for how she is going to survive her first year,” said Fernando Fraticelli, Amanda’s father. Administrators hope students not only survive but help make the honors college a showcase for the university, Gilmore said. Rutgers sees the program as a recruiting tool that will help attract the best student from New Jersey and beyond, he said. SaraAnn Stanway, an Ocean Township High School graduate who scored a 2270 out of 2400 on the SAT, said she understood the honors college is beneficial both for the students and for Rutgers.